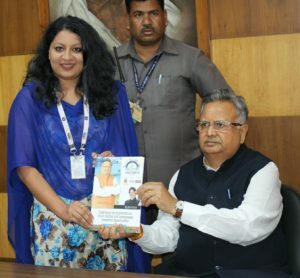 Chhattisgarh’s Chief Minister Dr Raman Singh today officially launched the Elets Smart City Summit, Naya Raipur by unveiling the summit’s brochure in the State capital. The brochure talks about the latest technologies being used by Naya Raipur and how they are being utilised in various Government schemes. Dr Raman Singh is likely to inaugurate the Summit and will also chair an industry round table conference to discuss the investment opportunities there. He is also scheduled to launch a special issue of Elets’ egov magazine, Asia’s first monthly magazine on e-governance. The Summit will also provide a platform to meet the representatives from Smart Cities and discuss the ample opportunities in Chhattisgarh, under one roof. The Smart City Summit Naya Raipur will be participated by various policy makers, stakeholders, experts and industry giants who will brainstorm over various needs, challenges, methodologies and vision related to the ongoing transformation of Naya Raipur in various segments of discussions under Smart Cities Mission. Chief Executive Officer of Naya Raipur Development Authority Mukesh Bansal will showcase the Smart City projects undertaken in the city. Naya Raipur is the the first greenfield capital city of India outfitted with all the world class framework and innovation in light of most advanced techniques. All the while, it is guaranteed that the city immovably keep ensconced the culture, values and diversity of the land in its spirit. The city is also selected under the Smart Cities Mission in the third round and will come up with many new innovative projects soon. Additionally, the State Government has made a separate allocation in the current budget session of around Rs 450 crores for Naya Raipur Development Authority. Along with all world class smart living utilities, Naya Raipur has incredible investment opportunities with unmatchable business oriented plans and subsidies, providing a sustainable base for business growth.